Efford Cottage is an excellent establishment offering a warm welcome and friendly atmosphere. Guests enjoy high class, luxury accommodation in large, delightful and exceptionally well equipped bedrooms. Each of the comfortable, well appointed rooms offers en-suite facilities, individually controlled central heating and just to ensure you stay cosy and warm, electric under blankets. The provision of beverage facilities, hairdryer, colour television, video, pay phone, clock radio and trouser press are standard in all rooms. Guests are asked to arrive between 4:30pm and 6:00pm, unless alternative advance arrangements are made. 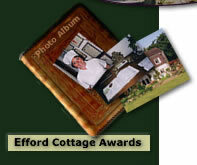 Unfortunately Efford Cottage does not accept bookings for children under the age of 14 years old. Well behaved dogs are welcome at a cost of £2.00 per night. When booking, please state that a dog will be included in the reservation.. Choose a delicious four course breakfast from an outstanding menu. Wonderfully cooked by Patricia, who has over 24 years experience in catering. Using produce from Efford's own garden, together with locally grown free-range foods, homemade bread, mouth-watering preserves and honey from their own bees. 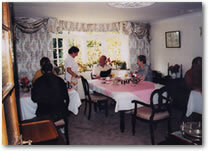 Relax in the charming dining room in an air of timelessness and well-being.